One of the true pleasures any food lover can experience in the Eternal City is perusing the city’s small delicatessens, bakeries, and markets. For many inhabitants, shopping for food in Rome is a social activity rather than a chore, a chance to interact with and support their local community. A strong focus is placed on quality over quantity and, if a product does not live up to expectation, the locals will vote with their feet and never come back. Likewise, if customers are impressed they will return and return, and tell their friends. After just a few repeat visits, stall holders, butchers, cheese sellers, and fishmongers will become your friends and your loyalty will be rewarded with friendly service and, more often than not, favorable prices. The rule of thumb is to greet the vendor with a cheery buongiorno, ask questions and listen to their advice. Romans love to talk about food and will be happy to share their family’s culinary secrets if you express an interest. Here is our guide on how to shop for food in Rome. Most neighborhoods in Rome have their own fresh produce market which will be open Monday to Saturday, from early morning until just after lunch. As a general rule, the fruit and vegetables found at the market are better quality than at the supermarket and will change throughout the year as products and varieties dip in and out of the seasons. It is frowned upon to stride up and help yourself at the stalls in Italy, vendors like to aid and assist your choices and will often inquire what you are planning to cook with their prized produce. This is to make sure that you purchase the right ripeness or variety to make your recipe a success so allow yourself to be guided. Produce is priced by the kilogram so can be ordered by weight, the number of pieces, or simply by saying basta così (‘that’s enough’) when you have the right amount. The bag is then placed on the scale and you are told how much. If you purchase several different things at one stall, the vendor will sometimes throw some fresh herbs in for free or round down the total to give you a little discount. The city’s delicatessens (which can be called pizzicheria, norcineria, salumeria, gastronomia or a whole host of other terms) are a wonderful place to shop for food in Rome. 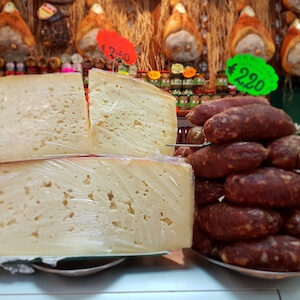 Here you can pick up ready-to-eat supplies as well as discover new types of cured meats and Italian cheeses, so don’t shy away from asking questions! Prices are displayed either by the kilo or by the etto (100 g) so will usually be ordered by weight. Many delicatessens operate with a number system; look out for a little distributor, take your number and wait your turn. Once you have ordered you will be given a receipt, take this to the cash desk and pay while the server wraps up your goods. Often shopkeepers will let you try before you buy, but it is not good practice to sample several things and leave without purchasing anything. Many delis also sell bread and will happily make you up a sandwich on request, a great-value way to have an authentic and delicious lunch in Rome. Shopping at the macellaio (butcher) can be slightly intimidating, especially if you are not familiar with the Italian vocabulary. In addition, the cuts can be slightly different to other countries and sometimes it is difficult to decipher the exact equivalent to what you are used to at home. The easiest way to get by is to explain the recipe you are planning to make and how many people you are cooking for, then let yourself be guided. Once you have a good relationship with your butcher you can also order more specific meats and cuts in advance. The forno (literally ‘oven’) sells a selection of sweet and savory baked goods ranging from different types of bread, biscuits, pastries and usually a simple choice of pizza al taglio (pizza by the slice). Again everything is sold by weight meaning you do not have to buy a whole loaf of bread, just ask for a half or a quarter. Italians like to avoid throwing away food, particularly bread, so being able to purchase the exact amount required helps to cut down on unnecessary waste. Much like the butcher, the pescivendolo or pescheria can be a little overwhelming, but the quality and freshness compared to the supermarket is worth a little awkwardness. In Rome, the main days for fresh fish are Tuesday and Friday and you may find some shops closed or with limited supplies on the other days of the week. Again, the best thing is to say what you are planning to prepare and listen to what they recommend. In Italy, fish and seafood are generally sold as is but most vendors will offer to clean or fillet your selection so utilize their skills to save yourself a tricky job at home. There are so many other tips and suggestions for eating and shopping in Italy. Read through our blog and watch our foodie video series. Read this helpful guide and learn to shop for food in Italy. Find out how to order and discover the local shopping customs at the delicatessens and bakeries of Rome.